Thomas Earl, born in Ireland in 1810, emigrated to Ann Arbor in 1833. He immediately purchased 200 acres of land in Northfield Township, and in a few months he married Mary Duncan. An ambitious man, he rapidly accumulated a fortune and began to take an active part in the political life of the township. 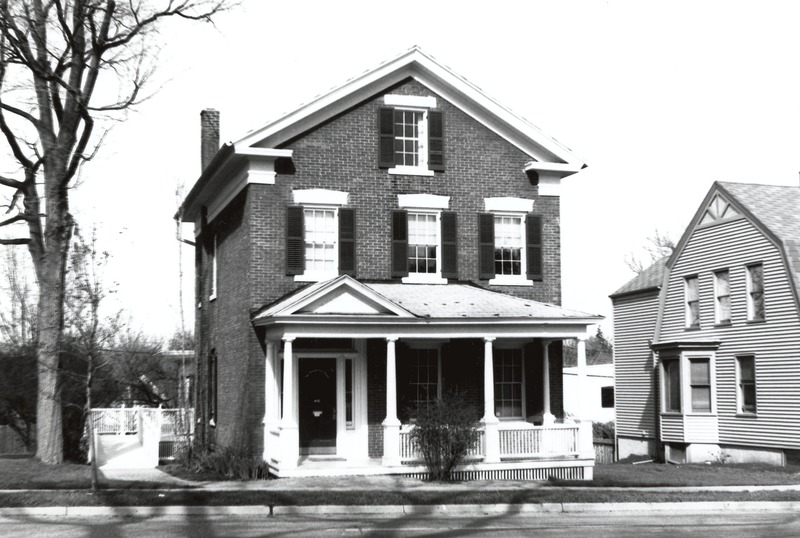 In 1849, saddened by the death of their young daughter, the Earls moved to Ann Arbor and opened a grocery store. They lived above the store until 1857 when they purchased two lots at this location, building this house on one and planting his orchard on the other. Earl served for some time as Alderman in Ann Arbor. Mary Earl survived her husband by many years, living to be a very old woman and providing her own subsistence by raising fowl and keeping a good garden. It is said that she sheltered her geese on the third floor of the house. At her death in 1899, she bequeathed the house to St. Thomas Catholic Church. The quality of the classic details in this Greek Revival house make it quite distinctive. Many of the six-over-six double hung windows still retain their old glass panes. The bricks of an unusually small size reputed to have been made in Ann Arbor at the time, are very evenly laid, demonstrating the mason's skill. The front porch was added about 1908. The lintels appear to be of cut stone painted white and shaped to match the interior window and door trim, a bold and unusual design. Fred Schaible bought the house at auction in 1900 for $1,300. In 1910 he borrowed $500 to renovate the badly run-down house. With a family of four children and a wife, and at a wage of $6 a week, this was a major loan. But with it, he was able to install a bathroom, a new furnace, hardwood floors, gas pipes, electric wiring, and new chandeliers, which could be used with either gas or electricity. The Schaible daughter, Lucille, married Harry Schmid, and they lived in the house until very recent years. Mrs. Schmid kept the pewter numbers "57" which identified the house before the street numbering system was changed in 1897. In 1990-91 businessman Peter Fink purchased the house and renovated it for office use.